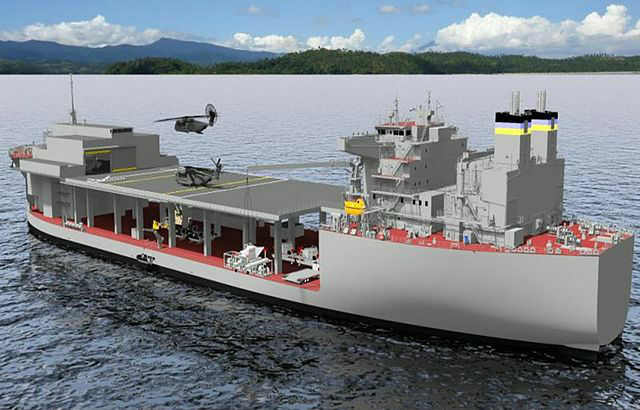 The mobile landing platform USNS Lewis B. Puller is scheduled to be christened in a ceremony scheduled Feb. 7, General Dynamics NASSCO announced Thursday. Martha Puller Downs, the daughter of the highly decorated Marine the 837-foot-long ship is named after, will perform the traditional breaking of a champagne bottle against the hull of the vessel, which is designed to serve as an offshore staging area for a variety of operations. It’s the third ship of the class, and the first to be configured as an “afloat forward staging base.” The variant includes a flight deck, fuel and equipment storage, berthing for 250 troops and repair spaces, according to the Navy. Lewis “Chesty” Puller served in World War II and Korea and became the only Marine to be awarded the Navy Cross five times. According to the defense publication IHS Jane’s 360, the Puller is scheduled to be delivered in September and to deploy next year.